Product Info The Sycamore Creek Workshop is located in New Yorks rural Hudson Valley, between the Catskill and Berkshire Mountains. In our barn, amid rolling hillsides and tree-lined streams, we handcraft our unique line of original design copper furnishings for the garden. Made of copper piping, pieces are sturdy, yet maintain a lightweight elegance. Our constructed pieces are generally soldered and/or brazed. They arrive ready for installation with a natural patina. Flexibily and innovation of design make it difficult to maintain a current catalog of our products. Our most recent catalog is available in a printable (Adobe PDF) format directly from this link. Please review the website and contact us with any questions. We also have a recent flyer available for download which can be printed from here. If for some reason you are unable to print this catalog you may request a catalog using this form. Our SycamoreKits are designed not to require any brazing. Each of these designs (named for some our favorite vines) is indicated throughout our site with the symbol pictured to the right. SycamoreKits are available fully assembled with a natural verdigris patina, or as a build-your-own kit. 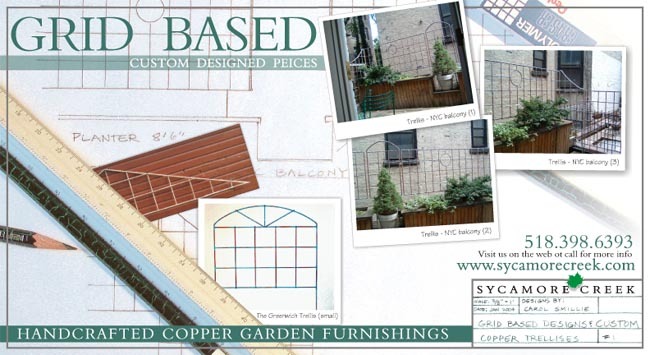 Kits contain everything required to create your own professional quality garden structure  including detailed illustrated instructions, precision cut copper piping, fittings, and a specially formulated retaining compound (no solder or welding required). Patina formula is not included in our kits. Please see hardware information. Mounting hardware for all trellises is also sold separately. Sizes noted throughout our web site are to the nearest inch. If you need an exact measurement, please contact us. Ordering Info To order please call (518) 398-6393 or email sycamorecreek@fairpoint.net. We accept VISA/MC or personal check. Shipping charges are noted throughout in parenthesis next to prices. Shipping Shipping costs are indicated s/h after each item. Our assembled trellises and arbors are shipped flat in a large box. Arbor sides are fully soldered, while the top is disassembled. We generally ship using FedEx 2-day service within two weeks of receipt of your order.